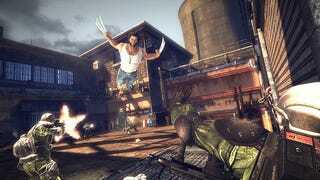 X-Men Origins: Wolverine isn't a movie game – it's a God of War clone. Surprised? So was I. After the boss's brief look at the game, I was hopeful that Wolverine would be an amazing character-driven action game. It's made by the Marvel Ultimate Alliance team; and even if it's not relying on the movie for story and background info on everyone's favorite Canadian (next to John Candy), there's still a lot the developer could draw on for the game's inspiration. X-Men Origins: Wolverine is not a movie game. But I suppose God of War is an amazing character-driven action game, too, so if Raven Software is going to draw on anything, why not that? X-Men Origins: Wolverine is a singleplayer action-adventure game starring the Hugh Jackman version of the clawed mutant from the X-Men comics. The plot follows most of what goes on in the upcoming movie, plus about "40%" original content, according to the developer. It's set for release on DS, PC, PS2, PS3, PSP, Wii and Xbox 360 the same day the movie hits theaters – May 1st. I spent a cumulative two hours with the PS3 version of the game at a junket event, switching back and forth with another games journalist whenever I died or finished a level. I got through the first jungle mission, a boss fight with Sabretooth and most of the Alkali Lake laboratory level. This build has to be near-final because the game is due out in less than a month, but it still looks a little rough mostly because of minor graphics issues (clipping, flickering shadows, etc.). Once More With Feeling: This game has a real problem with repetition. True, the combo system is extensive with lots of Square-Triangle-wash-rinse-repeat moves; but because some enemies block more attacks than others, you'll find yourself falling into patterns just to mow down baddies more efficiently. It doesn't help that the baddies all look pretty much the same. Or that the boss in the jungle level required the same move set to kill as the Wendigo Prototype mini bosses in the laboratory level (lunge on back, mash attack button, jump off, repeat, perform quick time event for the kill). Or that both levels require our hero to carry some two-handed burden from one area to another to open a door. Less Lara Croft Platforming, Please: I can appreciate a game that wants its users to think their way through a level – but this is Wolverine. He should be slashing his way through levels, not thinking. He doesn't have time for statue-pushing puzzles and carrying batteries or crank levers around. That's Cyclops' job! Quick Time Events To Kill Bosses: No thank you. Kratos barely got away with it. The RPG Element: Wolverine gains XP based on attacks, kills and pulling off combos. When he levels up, you can spend points on new skills, mutagens, reflexes or fight moves. I'm glad to see Raven carried something over from their Marvel Ultimate Alliance games. Also – you'll actually notice a difference in his overall strength. I got to level seven at some point in either the jungle or the laboratory level (sorry – can't keep ‘em straight with all that repetition), and suddenly all the enemies seemed just a little bit weaker than me – but not too, too weak. The Epic Factor: We were shown a level from later in the game where Wolverine takes on a Sentinel. It's a multi-phase boss fight that's one of seven overall in the game. The first part of the fight was a little Shadow of the Colossus in scale – but I didn't mind because the Sentinels are supposed to be epic huge and Wolverine at least didn't have to do any climbing. The second part was pretty boss (pardon the pun); in a mid-fight cut scene, the Sentinel falls out of its airborne trajectory after Wolverine cuts him up a bit and then the fight resumes with the player having to guide Wolverine through the air and down to the falling Sentinel where you get to cut him up so more. I don't care if skydiving isn't in Wolverine's canon (but, jeez, what isn't? ), it looked cool… like God of War, but with Wolverine. Shirtless Hugh Jackman: It may be a game, but I will take it where I can get it. If I pretend that Wolverine is a movie game, I can say it's one of the best movie games I've ever played. But it's not a movie game, says Raven Software senior producer Jeff Poffenbarger, so what can I say besides "It plays like God of War"? That may be disappointing to those who crave originality, but at the very least, it should be comforting to those who don't want their Wolverine complicated and anymore out of character than the movies make him.